I live in DC and your cherry blossom tutorial is one of the best likenesses I have seen!!! It is breathtaking and photos do not really do the Tidal Basin justice! These are so pretty and delicate looking. I used to live in DC and it is so worth going there for cherry blossom time. I’m going to give this a try this weekend-thanks for sharing it! So beautiful! I can’t wait to try this out, thank you! What?! I never even knew she wrote a book. So lovely! I took my younger son to Washington DC last spring break during the beautiful Cherry Blossom Festival. I thought the Cherry Blossoms were amazing. He was amazed that DC has Duncan Donuts and Denver doesn’t. Insanely gorgeous, Peaches! I love the extra touch of the water-blurred red ink. Your tree is glorious. Wishing you a trip to find some real cherry blossoms soon. those are some beautiful cherry blossoms. and yay, i’m so glad to see Miss Piggy found a happy home on your mantle! The Central Valley in CA is nothing to write home about, except during this time of the year. You can drive through some rural roads outside of Fresno, for example, and pass cherry, apricot, peach, plum, nectarine orchards, all in bloom. The shades of pink are beyond any Pantene catalog. If you ever have the chance, do it! I also grew up in the Central Valley of Calif. So of Fresno, 45 miles from their. I have to agree with you along with the Orange Blossom. What a great site to see and smell. Yes , I also say if you get a chance go thru the Central Valley in the Spring. You don’t have to go east to see cherry trees. Traverse City, Michigan, is FAMOUS for its cherry festival, which was originally held in May, when the trees are in blossom (it’s now held in July, go figure). I live near Memphis, Tennessee, and my cherry tree just finished blooming. Hey Aunt Peaches!!! Just found you today and have spent about an hour on your blog so far! You had me at your tagline!!! Love it! had to chime in here and tell you these are beautiful! I’m here in South Korea with my husband. He’s in the military and, so we live about 30 minutes south of the DMZ. It is so sad bc the 2 years we’ve been here the cherry blossoms come in, but then it gets so windy and knocks most of them down after a few days. It’s like you wait a whole year for 1 day of spectacular beauty. 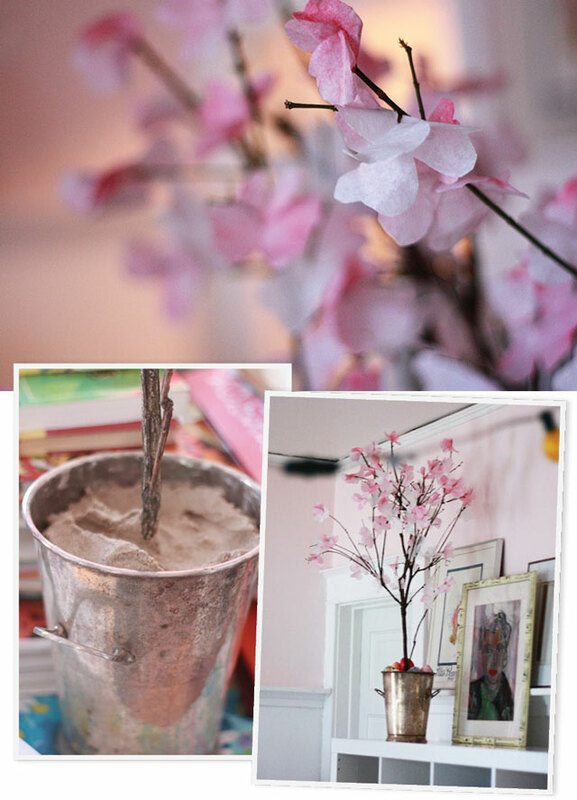 This tutorial will help in my mourning of our neighborhood cherry blossoms! Thanks!!! And I love Miss Piggy! I just went to a Korean thrift store the other day and scored a nice vintage cherry blossom painting on silk with a nice frame and a cool Asian ornate hook at the top! Love your post when you kicked the hornet’s nest. I don’t see what the big deal when it comes to your sharing your truth, your opinion, and actual facts and personal testimony from living there. I found it informative. To see the cherry blossoms is on my bucket list too. Yours are lovely. By the way Miss Piggy offeered a very sage piece of advice in Miss Piggy’s Guide to Life. She said, “Never wear yellow lipstick.” I have made sure to always follow that little maxim. These cherry blossoms are AMAZING. Oh My God. I just realized that I lived in New York City for years and years. I never ate at the Four Seasons! I have even been to restaurants that have closed, like Caravelle, Le Pavillion, Lutece, Romeo Salta, Cristcella, the Ocean Club, Trader Vic’s, Orsini’s, but never the Four Seasons. I like the more fun places now, like Mary’s Fish Camp in the West Village. L-O-V-E. I’ve never seen cherry blossoms in person, either. Or have I? I forget…probably NOT then. 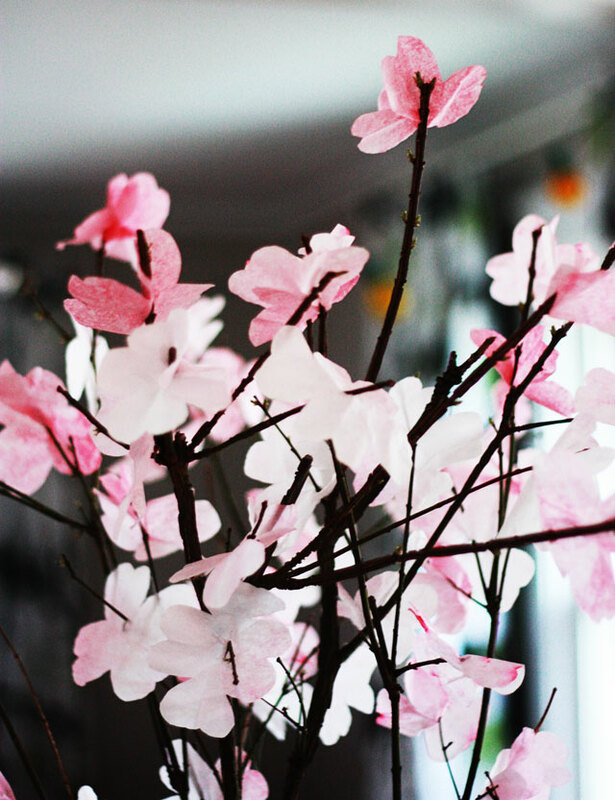 PINNING these–gonna make myself a cherry tree! Thanks!!! I still love them! But I am itching to shine up that silver container. Some day when I get organized, Ha! I’ll send you some pictures that my father took of cherry blossoms in Japan. in the 50’s. 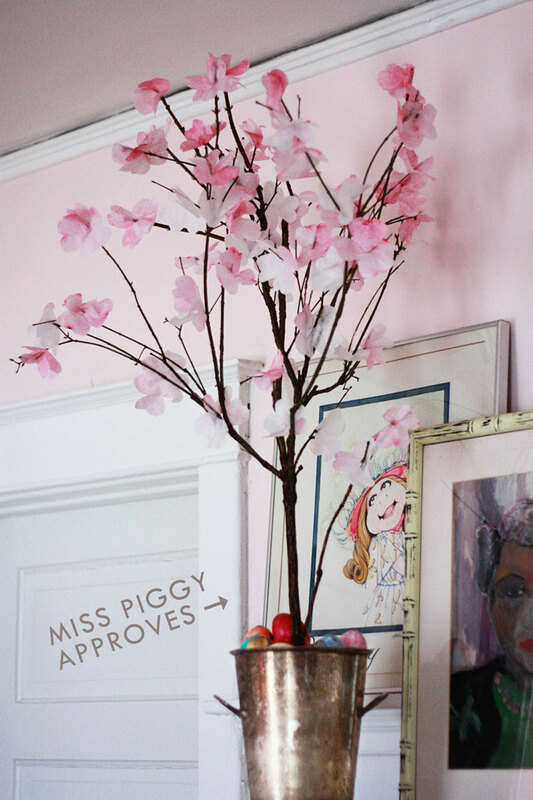 I just stumbled onto your blog looking to make cherry blossoms for a display at work and I LOVE IT! New fav. Hands down. 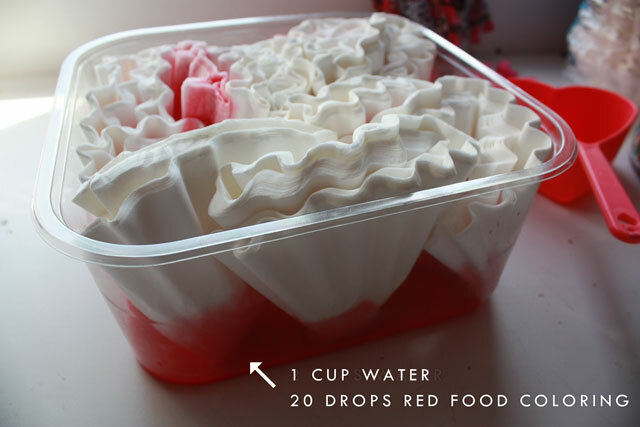 LOVE this idea but……I cut the filters in half as you said but then ended up with a whole TON of 1/2 things.WHAT??? This might be a case where the photo does more talking than the words. 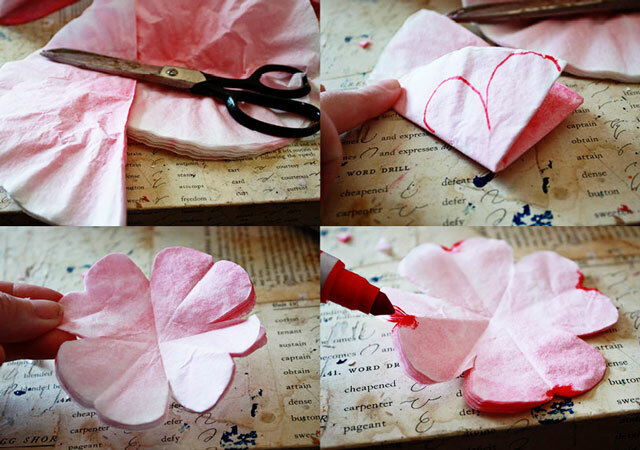 “After the coffee filters dry overnight, cut them in half and then into simple four-leaf clover shapes.” Take that half piece and fold into quarters, then cut a petal shape like the photo. The end result will be a sort of four-leaf clover type of shape. THANK YOU for this clarification!! I was trying to figure it out too-must be getting to late tonight to think in the abstract!! (Or my age, but we won’t go there… ;). 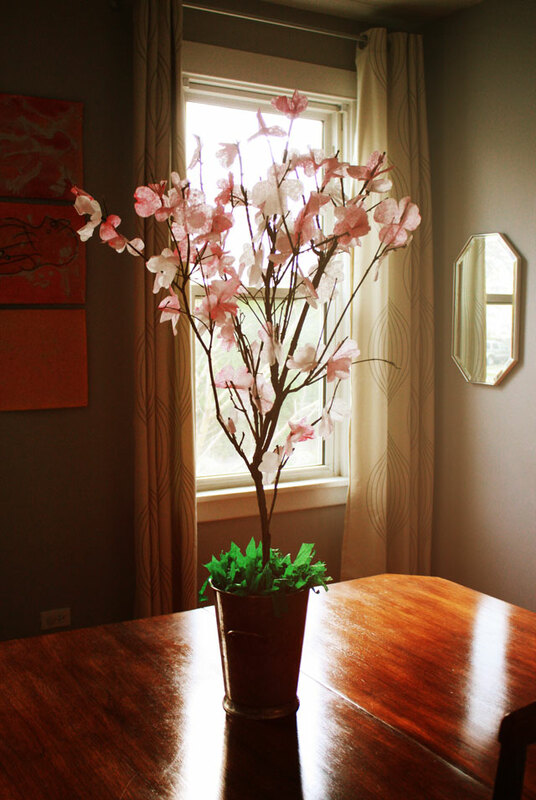 I had some beautiful silk cherry blossom branches-cost me a bundle about 5 years ago, (and I thought I was getting a good deal “On Sale”!!). These you made are actually prettier!! I *used* to do a LOT of crafting, sewing, knitting and renovating furniture; but after a long “break”, and losing everything in the fire-I’ve decided to get back into it-I certainly can’t afford to replace everything on Social Security!! My girls, now grown and starting families of their own, are thrilled Mom is going back to ” homesteading”. And since I found a couple of badly tarnished ice buckets at a thrift store myself-and LOVE using coffee filters to make things, (I made myself a 3ft Christmas Tree from filters this year!! ), I think this will be next on my list!! onthis site where you have given your Cherry Blossom turotial,you said “Sad fact that I have never seen Cherry Blossoms”. I am inviting you here in Gemany around the month of April/Mayto see the Cherry Blossoms,als also Apple Blossoms and all that blooms here in Spring. You can spend a week with me as my guest. This year the Cherry trees are already blooming and will be over in another week or two. Next year would be splendid. I am busy this year somehow and am sure to have time for you next year during this time of the year. My best greetings to you and your family. Thanks, Egi! They sound beautiful! Thanks..I’m making mine now. Drying them in microwave about 10 at a time. Works great! I absolutely love your silverware and am so glad to know you heard them speaking to you to gather them together! I think they are beautiful!